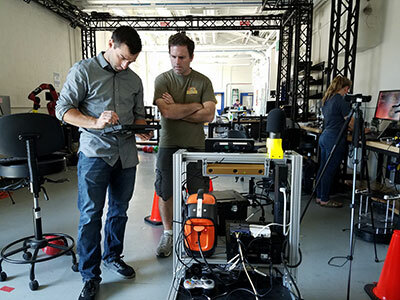 Zachary Byron ‘20 is teaching a robot to understand voice commands as a part of his Xerox Fellowship project, which is also his first research experience. An electrical and computer engineering major at the University of Rochester, Byron previously spent time in the military and working at L3 Technologies, an aerospace and defense communications company. 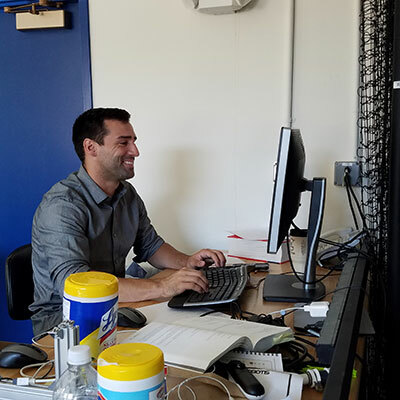 Now, he’s combining his linguistics experience with an interest in robotics to write software and develop and test algorithms in the University of Rochester’s Robotics and Artificial Intelligence Laboratory. 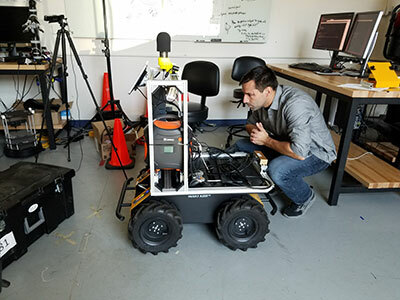 After taking Autonomous Mobile Robots, Byron decided to participate in the Xerox Fellowship for a chance to apply the principles he learned to real life situations. In the lab, Byron developed software to help humans and robots collaborate on tasks. His work involved writing C++ code to test his algorithms, finding and remove bugs, and testing his software on unmanned ground vehicles. He also spent time reading papers on the latest research that had been developed in the lab, so he could contextualize and understand his project better. Byron and his advisor Thomas Howard getting ready to test a robot. Bryon’s project integrated a lot of the lab’s research, including motion planning, state estimation, mapping, and natural language processing. These are all elements of how a robot understands its world, creates a model of it, and acts based on direction. Byron’s advisor, Thomas Howard, an assistant professor in Electrical and Computer Engineering, participated in research when he was an undergraduate at the University of Rochester. He describes those experiences as important in his decision to pursue graduate studies and influential in his development as a scientist. The research in his laboratory is highly interdisciplinary, so he likes that he gets to work with students from a variety of different educational backgrounds. He wants his students to learn the theory and practice of robotics and what it takes to conduct research and effectively communicate their findings. Byron checks to see that all parts of his robot are working correctly. Byron says he is learning how this experience would be useful whether he worked in industry or continued a career in research. He is glad that the Xerox program and the Kearns Center have a lot of support for students thinking about graduate school, too. Either way, he gets to learn about how research works and also learns specific practical skills like building software and testing robots. Byron at his work station where he writes and tests code.